Democritus. He was born in Abdera Greece, around 460BC. He studied natural philosophy and traveled to many places; he never married. He lived to be ninety, dying in the year 370BC. His atomic theory said that there are two elements, atoms and the void they are in. The theory states: All matter consists of invisible particles called atoms, atoms are indestructible, solid but invisible, and homogenous, atoms differ in size, shape, mass, position, and arrangement. Solids are made of small pointy atoms, and liquids are made of large round atoms, and oils are made of fine, very small atoms that can easily slip past each other. Democritus published over 70 books, was born to a wealthy family, studied pythagoreanism, and traveled to many places. 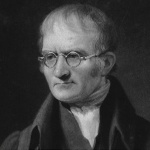 John Dalton. He was born September 6, 1766 in Cumberland England. He lived and worked as a teacher in England. He died July 27,1844. His atomic theory stated that elements consisted of tiny particles called atoms, elements are pure, because they are made of identical atoms, and all atoms of an element have the same mass. All elements are different because they have different masses. Compounds are pure and made of elements bonded together; they are not easily separated. Compounds have a fixed ratio of atoms. Each atom has its own weight, and there is a weight ratio between elements. Chemical reactions involve the rearrangement of atoms. Everything is made of atoms. All atoms of different substances have different weights. JJ Thomson. He was born in Cheetham Hill, part of Manchester, on December 18, 1856. He married Rose Elisabeth and had two children. He died August 30, 1940. He discovered electrons and figured out that atoms can be divided. His theory stated that atoms are mode of positive cores with negative electrons within it. It is called the Plum Pudding Model. Erwin Schrodinger. He was born August 12, 1887 In Vienna, Austria. He died January 2, 1961 in Vienna. He went to the University of Vienna. In 1920 he married Annemarie Bertel. In 1926 he used mathematical equations to find the likelihood of finding an electron in any given location around the nucleus. This is called the Electron Cloud Model. He is well known for his Scrodinger's Cat Theory. He won the Nobel Prize in Physics in 1933. James Chadwick. He was born October 20, 1891 in Bollington, United Kingdom. He died July 24, 1974 in Cambridge. In 1932, while working under Ernest Rutherford at Cambridge, he discovered the neutron, the third subatomic particle which exists in the nucleus with protons. He received the Nobel Prize in 1935 for his discovery.